Blueberries are in abundance right now and they are juicy, sweet and delicious! Give me a bowl of fresh berries to snack on and I am a happy camper. Having said that, sometimes I want something a little more fancy and dessert like. That’s where these blueberry oat bars come in. 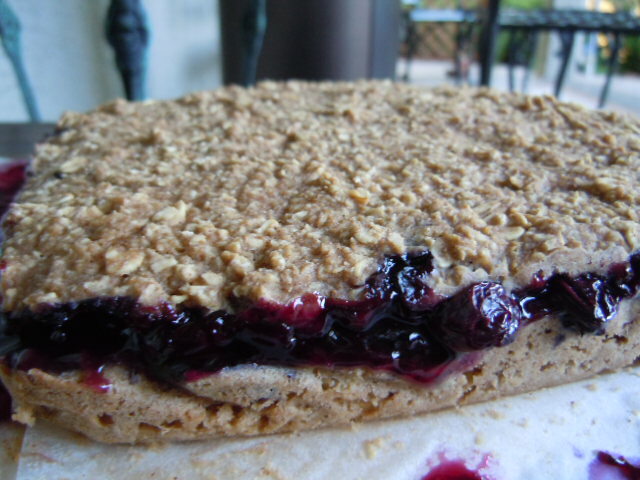 The blueberry filling is sandwiched in between two layers of oatmeal crust that is spiced up with cinnamon and nutmeg. These bars are not overly sweet which means you can enjoy one with a cup of coffee or hot tea mid morning and not get a sugar rush. This recipe originated from Fat Free Vegan Kitchen and you can see her recipe here. The recipe below reflects my changes to the original. The next time I make these I might add a little unsweetened coconut to the oatmeal mixture as well. If you don’t eat a lot of sweets these bars will most likely be sweet enough as written.We found them to be just right. However if you are used to a lot of sweet treats you might need to add a little more sweetness to the berries or the oatmeal mixture. Preheat oven to 375F. Spray an 8×8-inch baking dish with non stick spray. In a small saucepan, combine the blueberries, maple syrup, and juice. Bring to a boil over medium-high heat. When it boils, stir in the vanilla and the cornstarch or arrowroot mixture. Continue to stir as the mixture boils and thickens. Remove from heat and set aside. Put 1 1/2 cups of the oatmeal into a blender or food processor and grind it to a fine powder. Pour it into a medium-sized mixing bowl and add the remaining oatmeal, cinnamon, baking powder, and salt. Mix well. Stir in the apple sauce, maple syrup, water, and vanilla, and mix well, add nuts if using. Spread half of the batter into the prepared pan, smoothing well to cover the bottom of the pan. Spoon the blueberry filling over the batter, and cover the blueberries with the remaining batter. Bake for 30 minutes, or until the top is lightly browned. Allow to cool before cutting into bars. Note: these bars are not very sweet so taste the blueberries and the oatmeal mixture and add more sweetener of your choice if desired. 123 Calories, 2g Total Fat, 2g Protein, 24g Carbohydrates, 0mg Cholesterol, 81mg Sodium, 2g Fiber. 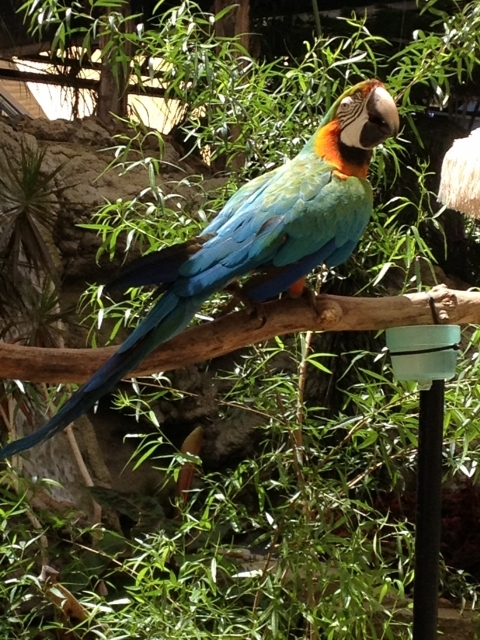 On a lark Sunday hubby Tom said he wanted to go the California State Fair! We hadn’t been for a couple of years so I was game to go. Before going we did talk about the fact that we might not be able to find anything healthy there to eat. We packed a couple of snacks with us and off we went. The Sacramento Zoo had a nice jungle display at the fair. There was a Hall of Heroes from movies. 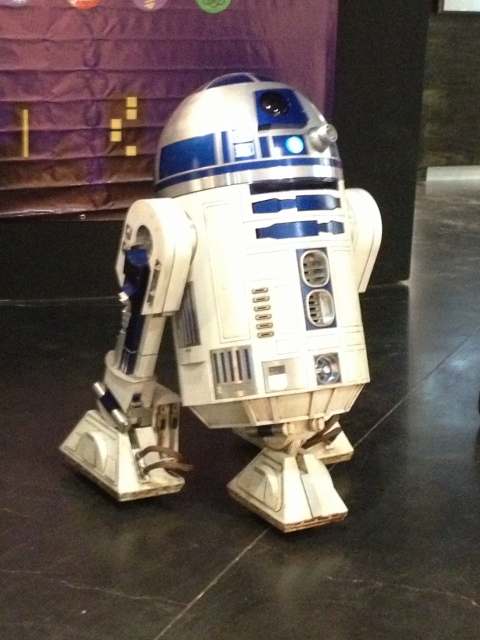 Remember R2D2 from Star Wars? 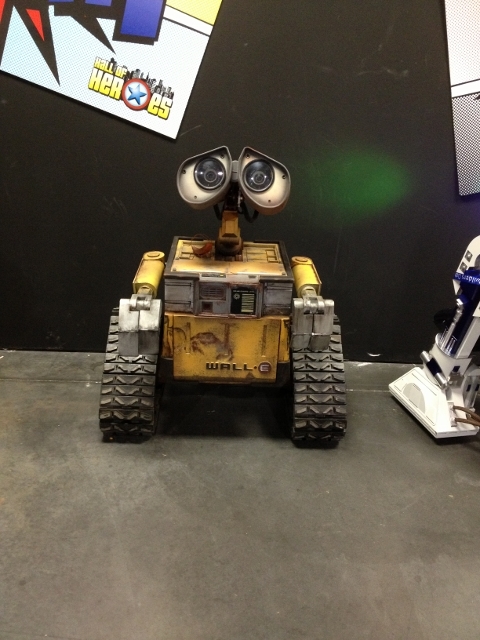 What about Wall-E? I loved that movie. Each CA county had a display showcasing their highlights. 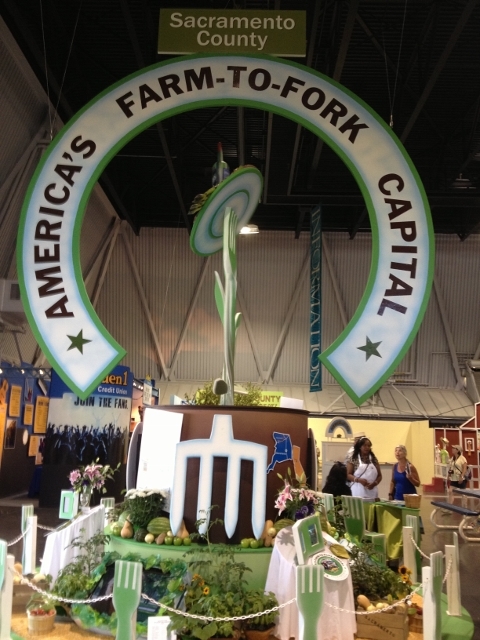 Sacramento county is proud of their Farm to Forks program. We were reminded that California is the largest agricultural producer in the nation. The Sacramento region contains 7,000-8,000 acres of boutique farms in addition to commercial growers. 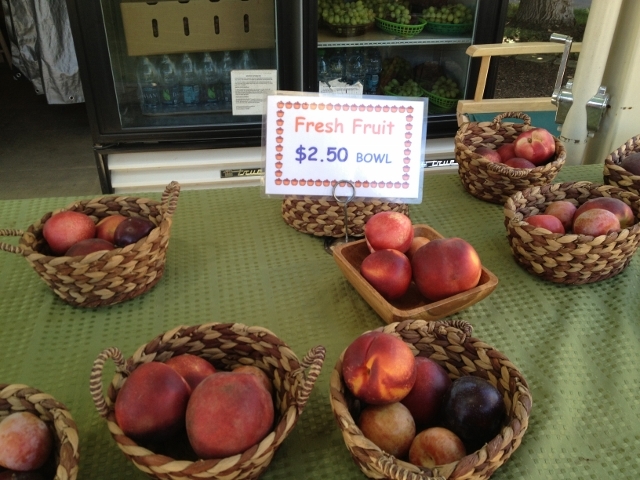 The greater Sacramento area is host to more than 50 farmer’s markets, many of them year round fixtures including the one I shop at in Placer County. 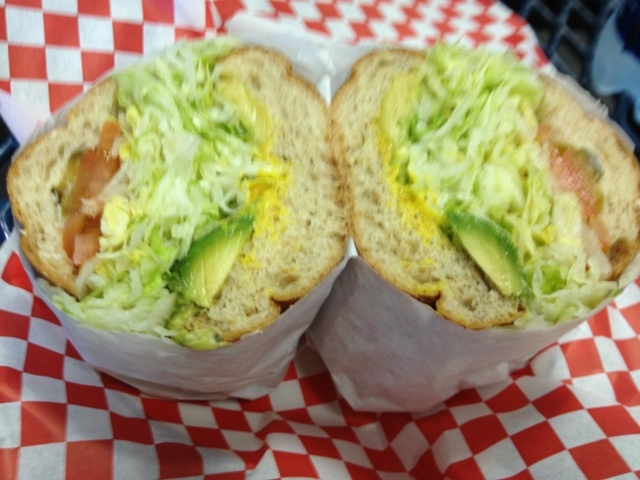 Sorry for the blurry photo but I did find a veggie sandwich on a whole wheat bun for lunch! It was mostly lettuce with a few little slices of tomato and some avocado.The fair guide had a list of the food vendors which included a special section that noted who carried items with fresh fruit and veggies. When we came upon this fruit stand I was so happy! 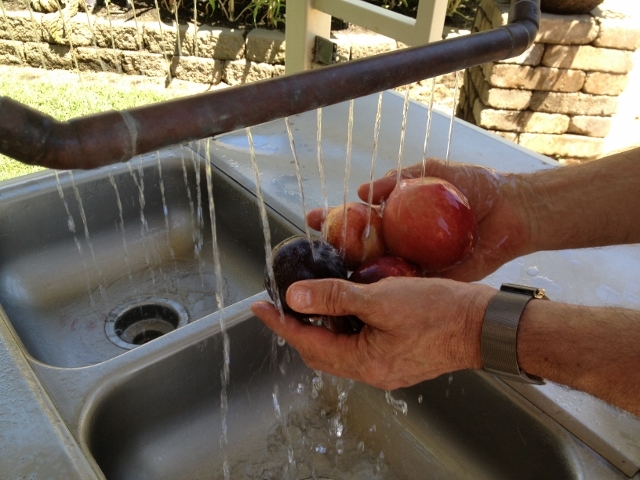 They even provided a washing station so you could enjoy your fresh fruit on the spot. I love this! 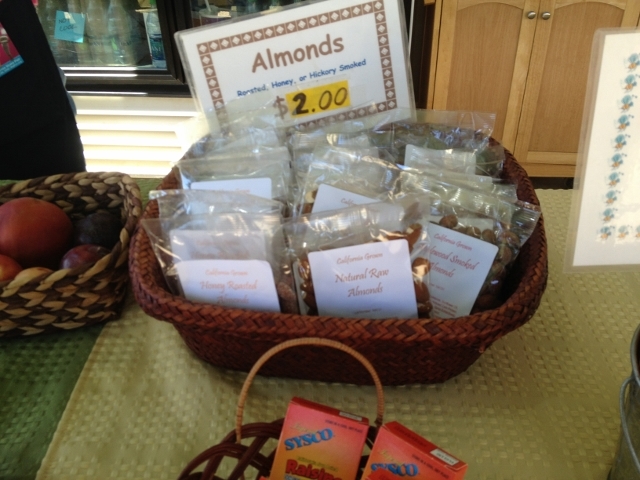 They offered raw almonds, raisins, grapes and watermelon too. It took a little looking around and getting off the beaten path to find the healthy eats at the fair but it’s good to know that there are some guilt free eats among a sea of deep fried everything. We even saw deep fried watermelon! Really? Thanks for being here. Feel free to leave a comment or ask a question. What is the strangest food you have seen at the fair? Deep fried watermelon has to be at the top of my list. Holy Moly, that blueberry middle looks so inviting in those bars! 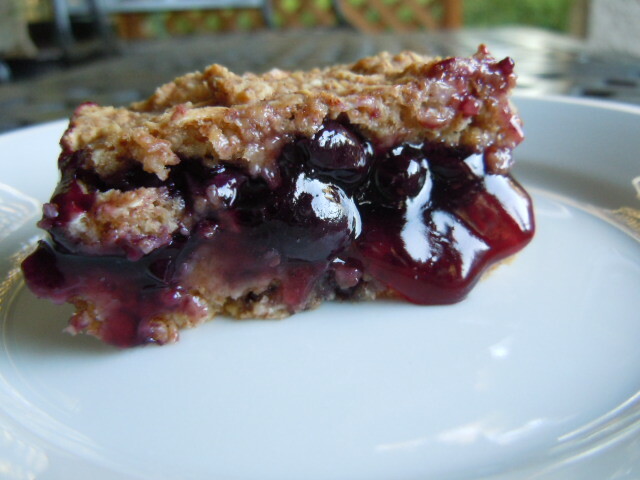 Michigan blueberries are due to hit the stores around here any day now…I might have to make up a batch of these bars! What a fun time at the fair. I haven’t been to a state fair in years. The local ones are just such a carnival I’m really not into the rides and all the fried foods, so I avoid them. Indeed the blueberry filling is amazing and photographs so well. 🙂 We skip the fried food and the rides – I think it’s age related! Ha-ha. Strangest food at the fair is a hot beef sundae. Ick. Nothing wrong with eating blueberries plain! A hot beef sundae – I think my tummy just did a flip! Yum! Those blueberry bars look so so good! I think the strangest thing I’ve ever seen at a fair is likely a deep friend mars bar. People were going crazy for them but I just couldn’t wrap my head around the idea. I WANT THOSE BARS NOW!!!!! Those look amazing!!!!!! Pinned away! The state fairs are crazy! I saw a news story on our local one for foods only – UGH! No thank you – I would get sick! 😉 One was a pickle wrapped in bacon & deep fried…. I have to wonder why the food is so unhealthy at the fair. It should be a celebration of the local farmers and the fresh food they grow! No matter I till managed to find some healthy eats among the mass of fried offerings.